Lounging on my bed, one leg stretched, and the other bent creating a space to cradle my laptop, pillows tucked all around me to support my neck and back in a posture that will send me crawling to the chiropractor, this is how I like to write. Close to 2:00am, the ocean reminds me of her presence as I hear the waves make their way to the shore. How lucky am I to hear that beautiful crashing sound from my bed. I spent my growing up years at the beach, slathered in baby oil and iodine baking under the sun with my sisters and my girlfriends, and swimming in the ocean all day. As a teenager, I had little fear of the ocean and on many occasions I swam beyond the waves when it was not safe. Nope, not even riptides, cold water temperatures, or the threat of jellyfish stings could keep me out of the water. 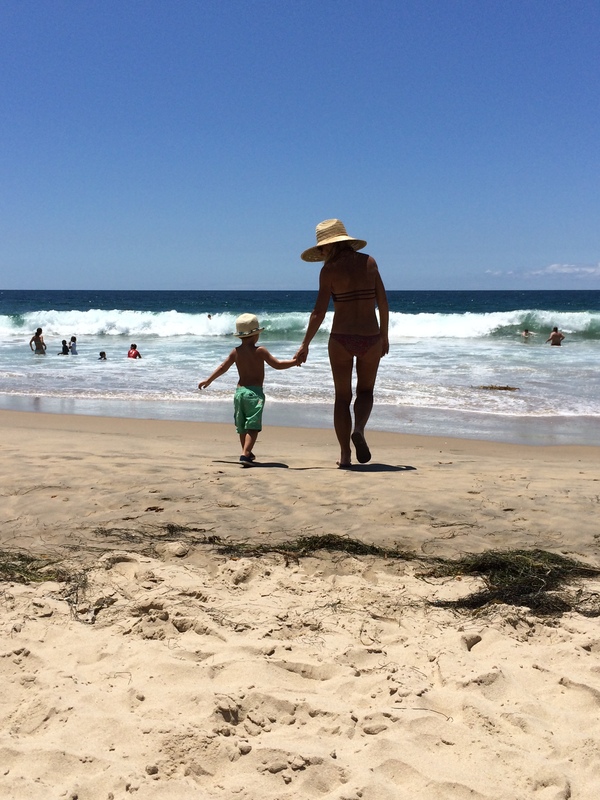 These days, I walk barefoot for miles through the shallow low tide, or hold my grandson’s hand on the shore as we run to and away from the waves. I might make my way waist deep, if the conditions are just right, small rolling waves, warm water, and the hot August sun. It’s a funny thing to be uncomfortable or fearful of something that was once second nature to me. Sure, I had my share of serious poundings; waves slamming me into ocean’s floor only to be churned up again by its powerful force. But I remember thinking and knowing . . . all I have to do is hold my breath, let my body succumb to the power of the ocean and eventually it will set me free. And it always did. Even the worse thrashing wouldn’t keep me out of the water for very long. Time to catch my breath was all I really needed. Hmmm . . . it occurs to me that my relationship with love has been a lot like my relationship with the ocean. Drawn to love, I loved even when it was dangerous. And when my heart took a beating, I had faith that I would come out of it better and stronger. Today, I love the sound of love. I can laugh as I run toward it and then run away, especially if a friend is holding my hand. I am comfortable alone in the shallow end, but sometimes wonder if I have traded faith for fear. Maybe I’m waiting for the perfect conditions, or maybe . . . . I just need time to catch my breath . . . Thank you for reading. Always grateful when fellow bloggers enjoy my stories. Nicely written AND “heard”. I wonder this too, but I stand in my faith and then fear dissolves regarding love. The Ocean, I may as well be your twin & with my wisdom of danger in my older age, I chose the safe path;)! I love your words and your wisdom. Thank you. Beautifully written….I go for catching your breath! Don’t know about you but I just can’t do another needy relationship. Prefer to wait for the right one, and work on becoming the right one… oh and not giving into temptation – that’s the hardest thing..
I’m a little tempted by a man right now.. he’s quite a bit younger than me and I’m feeling a little conflicted. I guess on some level I don’t believe it could last long term with a 10 year + age gap (I think he’s 34 – so 13 years) … I’m not that worried about the gap but future pain worries me. Part of me just wants to have fun and accept that it could be a great ‘for now’ relationship and may be that is just what I need. I’ve been there. It was fun :-). When it ended it has nothing to do with the age gap but still painful. Well, I slept on it and have decided to focus on others things …. the people that love me and that need me – my youngest son and daughter, my dad and my dog. All have been neglected while I’ve been in this deep funk.. I also have a little business idea to set up – that excites me. Although I’ve been healing, I’ve also been wallowing in pain (for years) from the people that have not been capable of loving me … and now I need to be appreciative of those who do. There will be someone better suited to me that will come along when the time is right. I’m going to get busy with my life and be patient. Just because there’s a strong attraction… and that I want him doesn’t mean it’s good for me. This guy is like candy – hard to resist but maybe not the healthiest choice. All very very tempting but I’m going to use my head these days. You really love the ocean. It holds an irresistible call. I do. Whenever I walk along the beach I’m so grateful that it’s so near to me.